New: There are some notes of his booms, just under the thumbnails. You can check the thumbnails first, if there is a picture you'd like to see. Then scroll down or click directly on the desired picture. 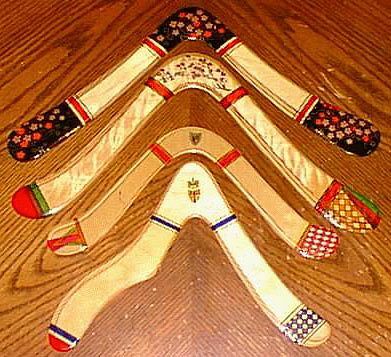 Another superb all round boomerang, showing its merit in paxolin. Designed from my wooden model of the same name, you will find that it will fit almost exactly into the inner contour of my large "Marathon". It is an easy boomerang to throw and catch, and makes an excellent long distance boomerang, when weighted, stands up well in strong windy conditions. A delightful little hook shape boomerang, developed in Paxolin from my small wooden \"Columbia Hook\". Easy to throw and catch and very good in windy conditions. 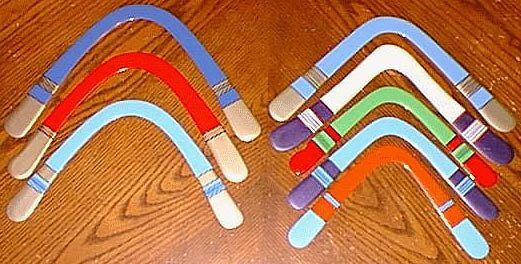 This elegant boomerang is the original of the "Omega" shape boomerangs, but a slimmer version than my former wooden model of 1973. 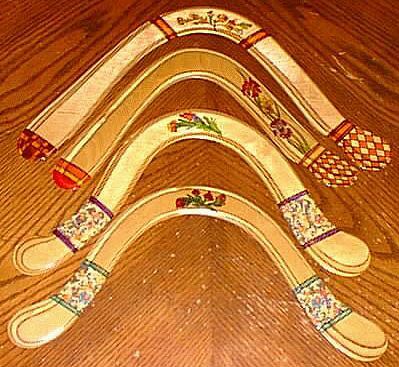 A lovely boomerang to throw, javing a gentle soaring flight, very soft in the hands for catching. A lovely miniature version of the \"Bluebird\", faultless in flight and very easy to throw and catch. Ideal for beginner or experienced thrower. A very good wind eater. A diminutive \"Duocurve\" shape boomerang which is easy for the younger members to throw. It has a gracefull flight, accurate return and easy to catch. Allthough designed before \"Mount Fuji\" it is remarkably similar in shape. A gentle little boomerang which is wasy to throw and catch, will give pleasing flights in most weather conditions. A lovely arc shaped boomerang, having a beautiful looping flight, which ends in a gentle hover. Easy to throw and catch and a very good bommerang for windy days. Designed on fine asthetic lines for the discerning, serious thrower. This is Tibor Horvath's boom. It is treasured. This little boomerang has the same high quality performance as its bigger brother. An easy boomerang to throw and catch. Remarkably accurate returns, and a good wind eater. 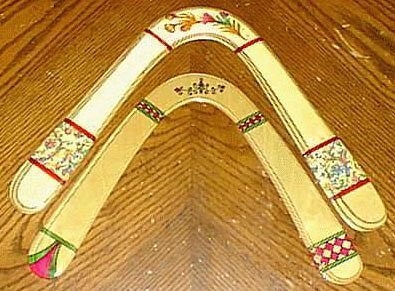 This unusually attractive boomerang was designed from a painting be the 17th century Japanese artist Hanabusa Icho and reproduces the outline of his painting of Mount Fujiama. A lovely little boomerang to throw, and returns very accuratly for an easy catch. 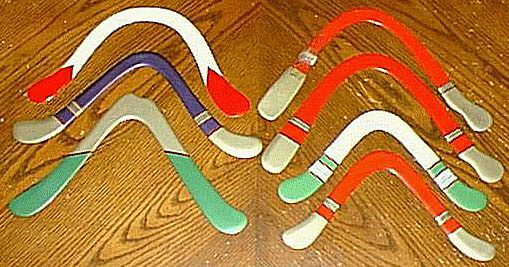 This pleasing shaped boomerang is not unlike a \"Reverse Hook\", with a narrow dingle arm and broader lifting arm. Although it requires a strong throw, distances of 80 yards are not unusual. Can be weighted for extra long distance flights. The \"Onado\" is an open \"V\" shape, with gracefull curving blades. Designed from my \"Duocurve\" boomerang, the \"Onado\" has a low flight path and, like the Duocurve, stands up well in windy conditions, has a large circular flight. The Otiga has the same pleasing three sides shape as the \"Tigarang\", but possesses graceful curving blade tips. The flight is similar to the \"Tigarang\", but has a slighlty lower orbit. 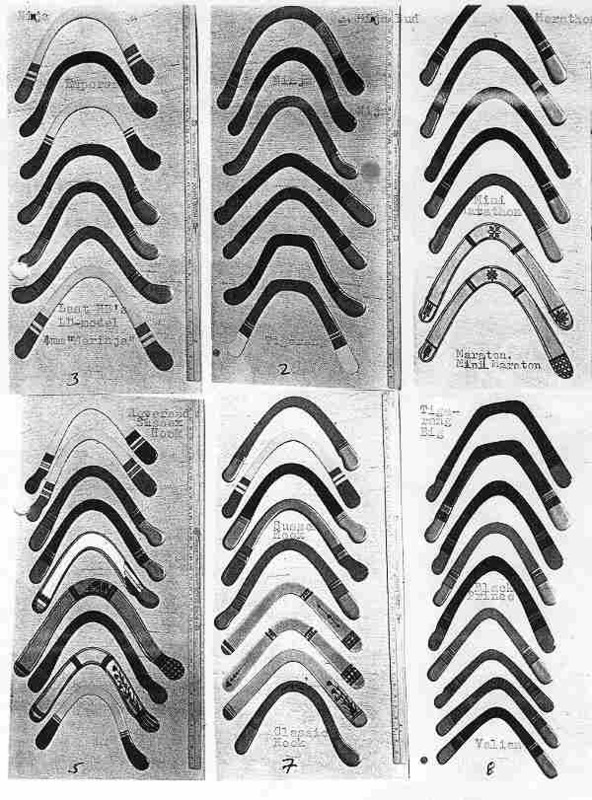 A semi-circular shape boomerang with slightly curved and bulbous tips. Has a large circular flight, staying fairly low in orbit. Requires a little breeze for perfect returns. Easy on the hands for catching. This is Pat Steigmans Samurai. It looks like a helluva flyer! 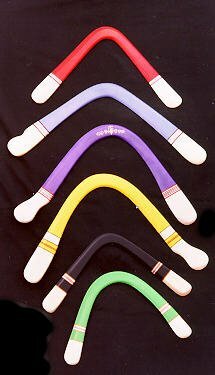 Designed from the inside curve of the \"Mini Marathon\", this little boomerang takes a snappy throw, has a pleasing accurate flight and return, and is very soft in the hand for catching. 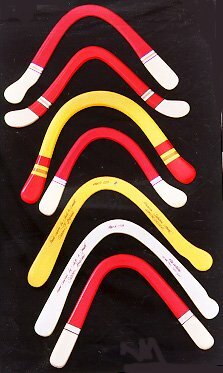 This beautiful boomerang is a sickle shape and a well known model associated with Herb Smith designs. 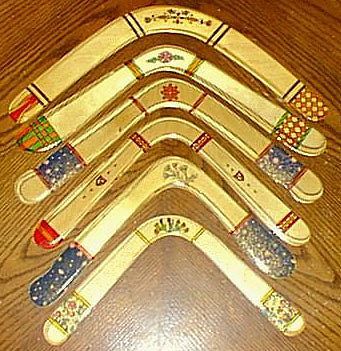 It has been copied in various forms by other makers throughout the boomerang world, which must surely be taken as a compliment to its graceful design and performance. It has a pleasing circular flight and is quite stable in windy conditions. 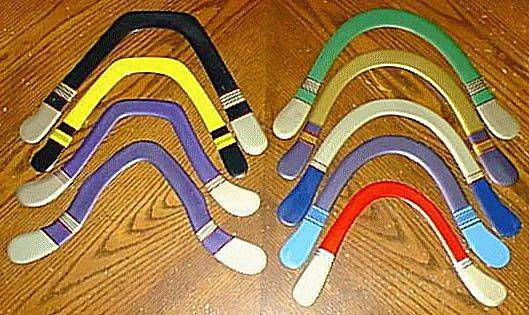 A must for your boomerang bag or collection. This is Lorenz Gublers proud property. As stated above by Herb, it is a must in every ld-collection! Another great performer of the \"V\" shape design. The Tornado is a very easy boomerang to throw and catch, has an accurate return and can be weighted for extended range. 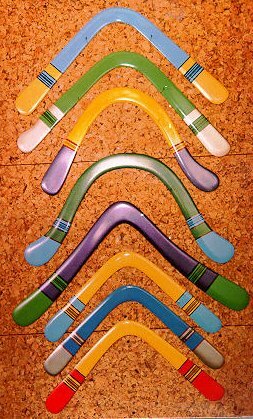 This model is the original of the so called \"Trapezoid\" shape boomerangs, and the fine little boomerang which I designed from wood in 1974. The Tigarang is an attractive three sided boomerang with a most pleasing circular flight pattern. TIGA is the Malay word for number 3, hence the name \"Tigarang\". A nice easy boomerang to throw and catch, and can be weighted for distances up to 90 yards plus. A petit V-shaped boomerang, being an easy model to throw and to catch. A good performer in windless conditions, where some other boomerangs have a tendency to fall short. A little gem of a boomerang! Requires a hard snappy throw, but will stand up well in windy or windless conditions and return most accuratly from over 50 yards, of \"V\" design. A pleasing broad \"V\" shape boomerang which requires a hard throw for best results. Has a high flight, but returns most accuratly for an easy catch, not a beginner boomerang! Please send us any info you have, on Smith booms! Thanks to Dan Neelands for sending us these three great SmithBoomPictures. I heard from hidden sources that Dan is able to copy the SmithDesign quite amazingly. But these booms here are no replicas. Thanks go to Steve \"Abosteve\" Conaway for sharing his great collection with the world.